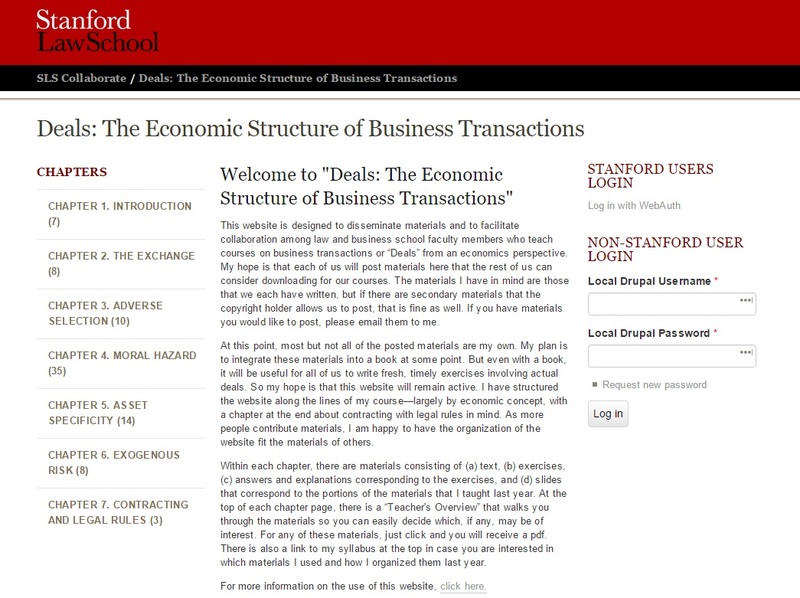 This website is designed to disseminate materials and to facilitate collaboration among law and business school faculty members who teach courses on business transactions or “Deals” from an economics perspective. This project started the way most things seem to: by accident. ["Случайность – это проявление и дополнение необходимости" (Анчаров Михаил - Теория невероятности).] Offerings of Massive Open Online Courses—free video classes on the internet—were still in the primordial soup stages: lots of evolution happening quickly and a lot of confusion. In the uncharted frontier of MOOCs, anything was possible. Michael Klausner, Professor of Law at Stanford, wanted to dip a toe into this new phenomenon. He was teaching The Economic Structure of Business Transactions, and he wanted to expand the audience beyond Stanford's classrooms. I was a web developer at the Law School, and I was curious about the challenges of getting his course online. (Remember, it was the ancient days...) There were interactive modules and a web of resources that could be applied to different topics, which was too tangled for the straightforward sitemap HTML offered. Enter Drupal. Here was a widely used web framework that allowed content to be more easily manipulated across pages. It was a tool to collect a lot of information in one place and make it useful, rather than an additional drag on resources. Through many UX sessions with Mike, we learned what requirements were specific to this class—and from there, figured out what existing tools we could integrate. Eventually, something with legs made its way out of the soup. That original classroom, now virtual, now spans universities in different countries. With the success of this course, Professor Klausner thought that the same tools could help elevate his research project. But that is another chapter of our story.